Posted on December 27th, 2009 by roxxyroller in Giveaways Canada. I’m always on the look­out for new DVDs for my lit­tle princesses. I think it’s good to have a wide vari­ety of edu­ca­tional enter­tain­ment that is fun to watch and a learn­ing expe­ri­ence. My most recent dis­cov­ery is a set of 4 DVDs released by Scholas­tic enti­tled Scholas­tic Trea­sury of 25 Sto­ry­book Clas­sics FAIRYTALES, MAGIC…and more! 25 children’s sto­ry­book clas­sics on 4 DVDs! 25 mag­i­cal children’s sto­ries are faith­fully adapted and brought to life in this 4-DVD col­lec­tion. From James Marshall’s zany fairy­tales to clas­sic sto­ries by Hans Chris­t­ian Ander­son, to clas­sic folk tales, par­ents and chil­dren alike are sure to enjoy these sto­ry­book trea­sures brought to life and fea­tur­ing celebrity nar­ra­tion by John Lith­gow, Danny Glover, Patrick Stew­art, Christo­pher Lloyd, and many more! When I think of Scholas­tic, I think of great qual­ity prod­ucts. There are enough clas­sics here for adults and kids to revel in it for hours. And the wide vari­ety of ani­ma­tion is first-rate! Though this boasts a rec­om­men­da­tion for chil­dren 3–9, adults will likely find it more reward­ing than most prime time dra­matic fare. Which prob­a­bly isn’t say­ing much con­sid­er­ing how bad net­work tele­vi­sion is, but it also says a great deal about the care and atten­tive­ness that Scholas­tic puts into these releases. These box sets are per­fect for in home or on the road and per­fect to share with every mem­ber of the fam­ily. Hours of enjoy­ment and price­less mem­o­ries will be had, all in DVD for­mat! I’d like to encour­age every­one to check out The Scholas­tic Sto­ry­book Trea­sures web­site at http://www.newkideo.com/. This site is a fan­tas­tic place for par­ents and kids to read and share their own reviews on the dvd’s as well as enjoy activ­i­ties such as down­load­ing colour­ing sheets and learn­ing more about the authors fea­tured in this Sto­ry­book Trea­sures collection! 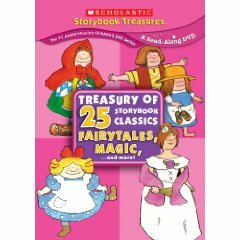 Want to win your own “Scholas­tic Trea­sury of 25 Sto­ry­book Clas­sics FAIRYTALES, MAGIC…and more!? Scholas­tic is giv­ing away this exact set to one lucky Cool­Canucks reader! How sweet of a prize!! I know that your chil­dren will absolutely adore this won­der­ful set just as much as my house­hold does!! I sub­scribed to Scholas­tic, sub­scribed to Cool­Canucks, and I now fool Cool­Canucks via Google Friend Connect. I have loved Scholas­tic since I was a kid. When I taught pre-kindergarten I intro­duced the chil­dren and par­ents to Scholastic. I fol­low via google friend con­nect and I’m an email subscrlber. I Fol­low @coolcanucks and @Scholastic on Twitter! I headed on over to Scholas­tic and signed up for their mail­ing list. I have sub­scribed to CoolCanucks!! I’m an email sub­scriber, google fol­lower, and I signed up for Scholastic’s emails. Thanks. I signed up for the Scholas­tic Email list, I am also an e-mail sub­scriber of yours and fol­low you via Google Friends con­nect, thanks! I’m already signed up under the same address as the required one! Signed up for Scholas­tic mail list. I signed-up on the Scholas­tic mail­ing list using my e-mail, sarahandsteve@xplornet.com. I also fol­low Cool­Canucks Via Google Friend Connect. I am on the Scholas­tic mail­ing list (same e-mail I use with you), I sub­scribe and fol­low you. Thank you. I signed up for the Scholas­tic mail­ing list with the email address lilyk@mail2world.com. I fol­low your blog. I sub­scribed to your blog with the email address lilyk@mail2world.com. I sub­scribe, and I follow.